Can an MNO Build Its Own Ecosystem? It rarely makes headlines when mobile money is under discussion, but Zimbabwe has one of the most developed and thriving mobile money ecosystems in the world. The Zimbabwean GSM market is dominated by home-grown MNO Econet, which has over two-thirds of all mobile subscriptions in the country. Its mobile money deployment, EcoCash is even more dominant, with its 5 million subscribers accounting for about 75% Zimbabwe’s mobile money market. In terms of how one single mobile money player puts its competitors in the shade, Econet and EcoCash are on a par with the world’s most famous MNO/mobile money pairing, Safaricom and M-PESA. Econet was founded by one of Africa’s richest men, Strive Masiyiwa, who fought a five-year legal battle to obtain an MNO license against the opposition of Zimbabwean President Robert Mugabe. Econet’s victory was a significant milestone not just for Econet and Zimbabwe, but also for the irresistible trend, of which it formed a significant catalyst, for dismantling state monopolies in the telecommunications sectors across Africa. In mobile money Mr. Masiyiwa and Econet recognized not only an opportunity for an additional revenue stream, but one which could also be used to advance the goal of further diversifying the company’s interests. Econet has therefore branched out beyond its core business, and EcoCash, one of the GSMA’s “sprinters” of rapidly growing deployments, played a central role in the strategy and execution of this expansion into different verticals across the Econet group. Zimbabwe’s mind-bogglingly high inflation in the early 2000s had resulted in the abandonment of the national currency in 2009 in favor of a basket of major regional and international currencies. The resulting lack of small denomination coins for use as change in retail locations meant that, in addition to the more universal factors that underpin P2P mobile money deployment adoption and usage, EcoCash had a very much home-grown value proposition for Zimbabwe’s consumers. At launch in 2011, EcoCash also benefitted from a massive drop in confidence in the country’s formal banking sector as a result of the hyper-inflation. Consequently around 23% of Zimbabwe’s population are “ex-banked”, having left the formal banking sector. Mobile money stepped in to satisfy some of the needs of this market segment, and by 2014 22% of Zimbabweans had a mobile money account, while only 17% continued to have an account at a formal financial institution. While M-PESA’s phenomenal growth in Kenya spurred a rush of third parties who sought to leverage it for ‘Digital Finance Plus’ such as solar power, and other products and services, in Zimbabwe, Econet recognized from the get go that by offering its customers a range of value-added products and services built upon a mobile money platform (or at least which can be paid for using EcoCash) it could take a proactive approach to mobile money ecosystem building while simultaneously meeting the objective of diversifying and expanding Econet’s business interests. This strategy is reflected in the EcoCash advertising slogan - “Live life the EcoCash Way”. For example, since 2012, EcoCash customers can use mobile money to hire/purchase home electricity kits directly from Econet Solar. Econet also launched a chain of solar-powered Econet Green Kiosks, at which Econet customers can charge their mobile phones for free. Indicative of the company’s vision, Econet also bought a majority stake in the U.S.-based water technology company Seldon Water and jointly launched Seldon Water Africa, which sought to bring activated carbon filters to the African market. The investment did not prove to be a wise one, however, and in September 2015 Seldon Water, based in Vermont, announced that it was shutting operations and its assets put up for auction. Econet has also turned to the educational and agricultural sectors, where it has identified consumer needs and business opportunities that will support both its mobile money and core telecoms businesses. In late 2014, Econet launched EcoSchool, a tablet computer platform that offers Econet users free access to a range of international educational websites, either through a subscription service via the app, or as part of a bundle that includes purchase of an EcoSchool Tablet. Econet has also applied this approach to the most important sector of Zimbabwe’s economy: agriculture. EcoFarmer provides microinsurance and information to 695,000 farmers to shelter them against crop damage as a result of drought or flooding. The service also provides valuable information via SMS, including weather reports, farming tips, and market price information. Earlier this year the company launched a new service to connect farmers via their mobile phone to expert agricultural advisors who answer specific questions the farmer may have in relation to livestock, tobacco and agricultural marketing. 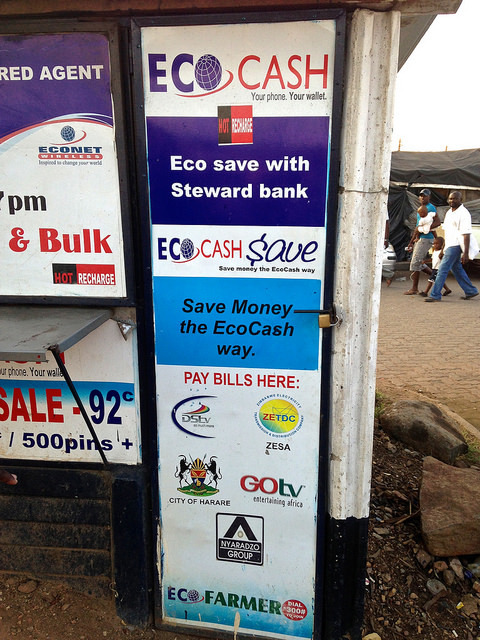 Needless to say, given the company’s activity in other verticals, Econet is also active in digital financial services, but in typical fashion it went further than most MNOs and bought its own bank, Steward Bank (“the Bank for people who hate Banks”), which partners with the EcoCash for the provision of a range of digital finance products. Steward Bank itself has been pursuing an aggressive branchless banking strategy to establish a presence for itself in rural areas using Econet’s agent network, as well as partnering with the Zimbabwean Post Office, Zimpost. Econet has also partnered with big names in the international remittance business to ensure that 'Econet Diaspora' users can send money to and from EcoCash wallets via Chitoro, Western Union, WorldRemit and MoneyGram. On the merchant payment front, Econet more than tripled the number of POS terminals in Zimbabwe, delivering to larger merchants 10,000 NFC-ready POS that can receive mobile-initiated EcoCash payments, and which can print receipts for the customer. It also recently launched EcoCash MasterCard debit cards, including one with NFC contactless capabilities, and virtual cards delivered via SMS for online purchases. It has even dipped its toe into the waters of online retail (groceries) with the EcoShopper app and website, and in the summer launched a classifieds website, Tengai. Econet has invested a lot of money, over US$1 billion in only a few years, to strengthen its provision of broadband and overlay services. And much as AliPay is the glue that holds together the behemoth that is Alibaba, increasingly EcoCash occupies a unique position that ties together Econet’s varied business interests. The $35 million in revenues EcoCash brought in in HY2015 was an increase of 30% over a year earlier, contributing 11% of Econet Wireless Zimbabwe’s total revenues, up from 7% in HY 2014. Over the same period revenues from voice dropped by 30%. As over the top (OTT) players such as Whatsapp and Viber (see Mondato Insight on this topic from 2014) eat into MNOs’ voice profits, mobile money plays will need to be well-entrenched if they are to resist their much-anticipated expansion into payments. Econet’s ambition, vision and implementation of a plan for growth of the mobile money ecosystem are commendable. But there are also inherent risks that its dominance, or at least involvement, right across the board could inhibit innovation and competition. For example, a few years ago EcoCash ceased (though recently reinstated) inter-network P2P transfers, on the somewhat spurious grounds that it could not vouch for its competitors’ KYC/AML efforts. Notably, this decision was made during a period when Econet’s profits were halved and EcoCash’s overall importance to Econet Wireless Zimbabwe was growing. In protest at perceived unfairness in internet access offered by Econet, Tengai was taken down by hackers a few days after launch. The breadth of Econet’s operations certainly make it unusual among mobile money deployments. While it is a company bursting with ideas about how to continue to build a mobile money ecosystem from the inside out, it is probably being hampered by a lack of serious competition in several key areas beyond the EcoCash mobile money platform. And despite its efforts, like everyone else it has failed to resolve the missing link in the mobile money chain: merchant payments. Although similar in terms of market share, smartphone ownership and dominance of the mobile money ecosystem, EcoCash still only contributes about half (in percentage terms) of the revenues M-PESA generates for Safaricom. The good news for Econet is that mobile money penetration in Kenya is over two and a half times that of Zimbabwe. If Econet, and the country’s other mobile money players, can keep growing adoption and usage, Econet is likely to find itself in a comfortable position in a few years’ time, like Safaricom is today. Much may depend on the attitude, and composition, of Zimbabwe’s government, but stronger competition, combined with interoperability, is likely to benefit Econet in the long run. Given the company’s heavy investment in mobile money, however, the short term may prove a little painful. The 12 Pays of Xmas! MCX: A Slow Death or a Resurrection?